Active Region 12192, a sunspot, is likely to produce coronal mass ejections, which could wreak havoc on satellites and power grids. The massive sunspot, previously known as Active Region 12192, was turned toward Earth in October and early November, but rotated out of view. While it was on the Earth-facing side of the sun, the sunspot did not produce any coronal mass ejections — hot bursts of material ejected into space at 4 million mph (6.4 million km/h) — which have the potential to damage satellites and power grids. 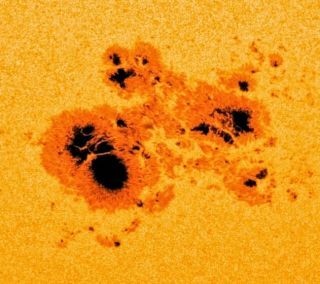 Now the active region has rotated back around to face Earth again, and although the sunspot has shrunk in size, it will likely be disruptive, NASA scientist Holly Gilbert told Space.com during a video interview about the massive sunspot. Sunspots are blemishlike regions on the sun where magnetic fields become very tightly bundled. The magnetic fields block light and heat from passing through the sunspot region, causing them to appear dark compared to the surrounding area.